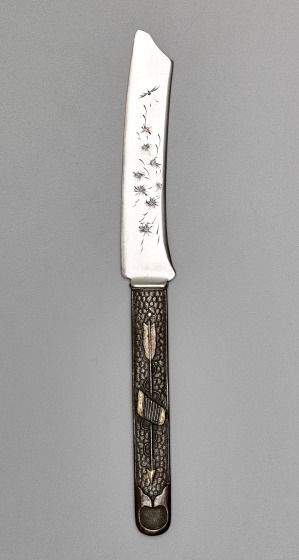 This fruit knife, one of a set of twelve, is an exceptional example of silver in the Japanese style, popular in the United States during the late 19th century. Its design is based on Japanese kogatana, utility knives with removable handles called _kozukas _commonly made of shakudo, an alloy of gold and copper patinated to resemble black lacquer. The cast bronze handles of Gorham's version feature Japanese motifs, such as landscapes, figures, and animals, molded in relief and heightened with gold. The handles are affixed to silver blades engraved with bamboo and other plants, as well as insects. Charles H. Carpenter, Jr., Gorham Silver 1831-1981 (New York: Dodd, Mead & Company, 1981), 102. "Shakudo," CAMEO: Conservation & Art Materials Encyclopedia Online, accessed 5/28/2015, http://cameo.mfa.org/wiki/Shakudo. 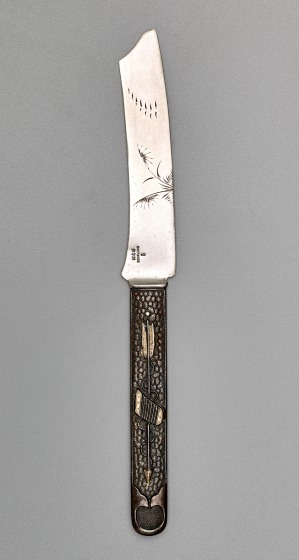 View an 18th or 19th century kozuka, the form that inspired the handle of this fruit knife. View an early or mid-19th century kozuka, the form that inspired the handle of this fruit knife. Watch a video about Gorham Manufacturing Company. Read more about Nineteenth-Century American Silver.